Who Pays a Buyer's Agent? Before I officially start working with a Buyer I often meet with them for a no-obligation consultative session. It’s really a two way interview. They have an opportunity to pick my brain about the market, the buying process, and me- my work style, my philosophy about home buying, and my life outside of work. Similarly, I am asking them questions about their interests, their thoughts about buying, and what they’re looking for in a home and an Agent. Hopefully based on our conversation we’re each able to make a decision if we’d work well together. One of the questions I am almost always asked is “Do I have to pay you?” People like to understand what funds they’ll need for a home purchase. They typically know they need to have money for a down payment and closing costs and want to know how an Agent’s fee fits into that picture. In almost all cases, a Buyer’s Agent will not look to collect a fee from the Buyer. When a Seller signs a listing contract with their Selling Agent, also known as the Listing Agent, they agree to pay a fee to that Seller’s Agent’s Broker. That Broker then offers a portion of the Seller’s fee to the Broker that represents the Buyer’s Agent. For example, let’s say an Agent from Summer Day Realty represents the Seller for the home you’d like to purchase. I’m working as your Buyer’s Agent and I am an Agent for William Raveis, so William Raveis Real Estate officially represents you as the Buyer. When you close on that property, a fee is charged to the Seller. The Seller pays a commission out of the proceeds from the sale, usually a percentage of the sale price or sometimes a flat fee. 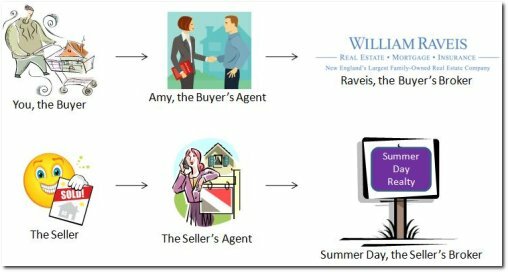 Summer Day Realty then offers a portion of that commission, again usually a percentage of the total commission or a flat fee from the total commission, to William Raveis Real Estate. William Raveis Real Estate then takes a portion of their part of the commission and compensates me. With the portion of the commission that William Raveis keeps, they use the funds for various initiatives- their website, company advertising, paying the electricity bill at my office, etc. So, from our example, a commission paid by the Seller is typically split 4 ways- a portion to Summer Day Realty the Broker, a portion to the Seller’s Agent for Summer Day Realty, a portion to William Raveis Real Estate the Broker, and a portion to the Buyer’s Agent for William Raveis Real Estate (me). An additional caveat is if there is a relocation company involved with the Seller or Buyer. In that case, the relocation company is also paid a portion of the commission- so the Seller’s fee is technically split 5 ways. When would a Buyer have to actually pay an out-of-pocket Buyer’s Agent’s fee? Usually only if the Buyer decides to buy a For Sale By Owner property using a Buyer’s Agent and the Seller of that property refuses to pay the Buyer’s Agent’s Broker a fee. As a Buyer, if you would like to work with a Buyer’s Agent in a For Sale By Owner transaction, your Buyer’s Agent can often negotiate the fact that the Seller will pay their fee. However, if a Seller refuses to pay your Buyer’s Agent’s Broker a commission, you, the Buyer, may be obligated to pay your Buyer’s Agent’s Broker a commission. This can all get tricky, so if you’re working with a Buyer’s Agent and want to see For Sale By Owner properties, make sure you understand up front who will pay the Buyer’s Agent’s fee. Your Buyer’s Agent should make this all clear to you. A word of advice, because each Broker and Buyer’s Agent is different, be sure to ask them how they’re compensated when you’re interviewing each Agent. They should give you a straight forward answer and cover various scenarios based on the different types of properties you’re considering. This will help ensure there is no misunderstanding regarding who compensates the Agent’s Broker once you find the property right for you.